The "DL25a" is the name for the form the examiner uses to record your performance on the practical driving test. The examiner will write down on this form any faults you made and which manoeuvres you were asked to do. Driving faults are divided into three types: Minor, Serious and Dangerous faults. Driving faults will not usually cause you to fail. A driving fault is a minor error, which, on its own, is not a serious problem. However, if the total of your driving faults is sixteen or more, you will fail, even if there are no serious or dangerous faults. If you keep repeating the same driving fault (for example, stalling), the examiner will see that you have a problem with your skills in that area and will mark that as a serious fault - which will result in a fail. A serious fault will result in failure. Even if you make only one fault on test, if it is a serious fault - you fail. A serious fault is something which could cause danger or inconvenience to another road user. A dangerous fault will definitely result in failure. Even if you make only one fault on test, if it is a dangerous fault - you fail. A dangerous fault is something which causes real danger to another road user or yourself. It could be evasive action the driving examiner or another road user has being forced to take to avoid an actual crash from happening. Listed below is a list of all the criteria you will be examined on during your practical driving test. The driving test report explained section guides the learner driver through the driving test report sheet completed by the driving examiner. The start of the test will involve the examiner asking you to read a vehicles registration number. If you require glasses or contact lenses for reading, they must be worn for this test and whenever you drive. If you cannot read the number plate this will result in a fail. For specialist vehicle tests that don�t require you to take a separate theory test, you will be asked questions on the Highway Code and other motoring matters related to your speciality. You will also been asked to identify some traffic signs. 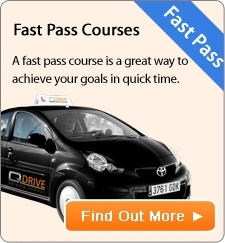 If you have already passed a theory test you will not be asked Highway Code questions at the practical test stage, but you should still have a thorough knowledge of it. Safety questions (if applicable) � you should know the location of, and be able to operate, safety components such as fire extinguisher, fuel cut-off switch and emergency door. The examiner will be assessing your ability and skill in bringing your vehicle to a stop safely, promptly and under full control and avoiding locking the wheels. In the event of wet weather, it can take twice as long to stop safely. You will need to display the ability to control the vehicle safely whilst reversing round a corner, reverse parallel parking or bay parking. You must take good effective all round observation throughout the manoeuvre and show consideration to other road users. The examiner will be looking for a high level of car control, keeping the car slow and accurate enough to not touch kerbs. The turn in the road manoeuvre should be carried out with due regard for all other road users. You will need to display to the examiner a basic but essential level of safety checks applicable to your vehicle. This can include fluid locations and levels, lighting and tyre safety checks. These questions are commonly know as Show Me Tell Me questions. You must be able to display the ability to turn your car around by whatever means available, making sure you take effective, all round observation, showing consideration to other road users and pedestrians. You should control your vehicle smoothly making proper use of the clutch, accelerator, brakes and steering. You should not use a driveway or allow your vehicle to mount the pavement as this could damage your vehicle. You should be able to securely erect wheelchair ramps, safely install the wheelchair and an imaginary wheelchair occupant into your vehicle, ensure the wheelchair and occupant are secured in readiness for the journey and reverse the entire process. You will need to demonstrate the skills necessary when uncoupling and recoupling your vehicle, driving the towing vehicle to a designated position prior to re-coupling safely. Before you start the engine make sure that you are comfortably seated and all controls can be safely operated. This section covers, where appropriate, the safe and controlled use of accelerator, clutch, gears, foot brake, parking brake, and steering. Additional specific control elements apply to the drivers of different vehicle categories. Always try and use the vehicle controls as smoothly as possible. This means less wear and tear on your vehicle and a smoother ride for your passengers. Make proper use of your accelerator and clutch to make a smooth start. Always depress the clutch just before you stop. Select the correct gear to match the road and traffic conditions. Change gear in good time but not too soon before a hazard. Do not allow the vehicle to coast by running on in neutral or with the clutch depressed. There should be no need to look down at the gear lever when changing gear. Use the foot brake smoothly and progressively. Brake in plenty of time for any hazard. Make full use of the parking brake whenever it would help you to prevent the vehicle rolling backwards or forwards, and if you are parking. Steer the vehicle as smoothly as possible. Avoid harsh steering, or steering too early or too late as it may cause you to hit the kerb or swing out towards another road user. If you are riding a motorcycle slowly, maintain a straight line and do not allow the machine to wobble towards other vehicles..
You will need to demonstrate your ability to move off smoothly and safely on the level, on a gradient and at an angle taking the correct precautionary observations. Use all the mirrors fitted to your vehicle safely and effectively. You must always check carefully before signalling, changing direction or changing speed. You should demonstrate you can use the mirrors signal-manoeuvre (MSM) routine effectively. You must signal clearly to let others know what you intend to do. You should only use the signals shown in the Highway Code if it would help other road users (including pedestrians).Always signal in good time and ensure that the signal has been cancelled after the manoeuvre has been completed. Do not beckon to pedestrians to cross the road. Allow plenty of room to pass stationary vehicles, obstructions and be prepared to slow down or stop. A door may open, a child may run out or a vehicle may pull out without warning. You should understand and be able to react to all traffic signs and road markings. You must act correctly at traffic lights, and check that the road is clear before proceeding when the green light shows. Obey signals given by police officers, traffic wardens and school crossing patrols. Look out for signals given by other road users, including people in charge of animals, and be ready to act accordingly. You should make safe, reasonable progress along the road bearing in mind the road, traffic and weather conditions and the road signs and speed limits. Make sure that you can stop safely, well within the distance you can see to be clear. Do not speed. Remember, as a new driver, your licence will be revoked if you get six or more penalty points during the first two years, and you will have to retake and pass both theory and practical tests. Always keep a safe distance between yourself and other vehicles. Remember, on wet or slippery roads it takes much longer to stop. When you stop in traffic queues leave sufficient space to pull out if the vehicle in front has problems. In order to pass your test you must show that you can drive at a realistic speed appropriate to the road and traffic conditions. You should approach all hazards at a safe, controlled speed, without being over cautious or interfering with the progress of other traffic. Always be ready to move away from junctions as soon as it is safe and correct to do so. Driving excessively slowly can create dangers for yourself and other drivers. You should be able to judge the correct speed of approach so that you can enter a junction safely and stop if necessary. Position your vehicle correctly. Use the correct lane. If you are turning right, keep as near to the centre of the road as is safe. Avoid cutting the corner when turning right. If turning left, keep over to the left and do not swing out. Watch out for cyclists and motorcyclists coming up on your left and pedestrians who are crossing. You must take effective observation before moving into a junction and make sure it is safe before proceeding. Only overtake when it is safe to do so. Allow enough room when you are overtaking another vehicle. Cyclists and motorcyclists need as much space as other vehicles because they can wobble or swerve suddenly. Do not cut in too quickly after overtaking. Take care when the width of the road is restricted or when the road narrows. If there is an obstruction on your side or not enough room for two vehicles to pass safely, be prepared to wait and let the approaching vehicles through. When you turn right across the path of an approaching vehicle, make sure you can do so safely. Other vehicles should not have to stop, slow down or swerve to allow you to complete your turn. You should position the vehicle sensibly, normally well to the left. Keep clear of parked vehicles and position correctly for the direction that you intend to take. Where lanes are marked, keep to the middle of the lane and avoid straddling lane markings. Do not change lanes unnecessarily. You should be able to recognise the different types of pedestrian crossings and show courtesy and consideration towards pedestrians. At all crossings you should slow down and stop if there is anyone on the crossing. At zebra crossings you should slow down and be prepared to stop if there is anyone waiting to cross. Give way to any pedestrians on a pelican crossing when the amber lights are flashing. You should give way to cyclists as well as pedestrians on a toucan crossing and act correctly at puffin crossings. Choose a safe, legal and convenient place to stop, close to the edge of the road, where you will not obstruct the road and create a hazard. You should know how and where to stop without causing danger to other road users. You must be aware of other road users at all times. You should always think and plan ahead so you can judge what other road users are going to do, predict how their actions will affect you and react in good time. Anticipate road and traffic conditions, and act in good time, rather than reacting to them at the last moment. Take particular care to consider the actions of the more vulnerable groups of road users such as pedestrians, cyclists, motorcyclists and horse riders. You should understand the function of all the controls and switches, especially those that have a bearing on road safety. These include indicators, lights, windscreen wipers, demisters and heaters. You should be able to find these controls and operate them correctly when necessary, without looking down. Driving skills should demonstrate recognition of the principles of Eco Safe Driving, including appropriate use of the vehicle controls. This means driving economically with forward planning will eliminate the need for harsh braking and / or acceleration.